Catalign Innovation Consulting: Why does U G Krishnamurti say, “Thought is your enemy”? Why does U G Krishnamurti say, “Thought is your enemy”? 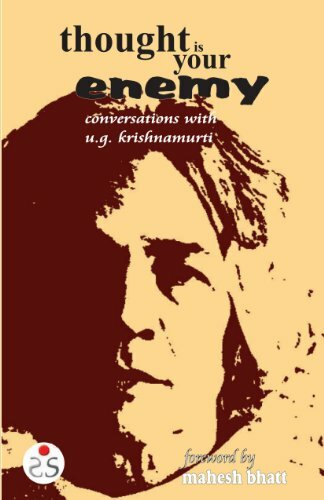 I recently read U G Krishnamurti’s “Thought is your enemy”. UG, as he is popularly known, is one of the blunt spiritual teachers. This usually means there is no apparent common ground between UG and the reader (or the person conversing with him). “Thought is your enemy” is a compilation of discussions between UG and various seekers in India, Switzerland, Australia, Netherlands and UK between 1985 and 1990. In “Thought is your enemy”, UG is consistent in his position that thought is not an instrument that can help us in solving our problems; on the contrary, it only creates problems. Why does UG say that? Let’s explore it through three claims he makes in the book. Thought destroys sensitivity: UG says, “The function of the brain in this body is only to take care of the needs of the physical organism and to maintain its sensitivity, where thought, through its constant interference with sensory activity, is destroying the sensitivity of the body.” We might be able to observe this in our daily life. When we are really anxious or stressed, we tend to eat more or sometimes eat less. Body is sending signals about when we should eat and when we should stop eating. However, the constant interference of thought is obscuring those signals. Hence, our eating habit may become abnormal. What happens to eating also gets extended to sitting posture, sleep and various others habits because our sensitivity gets diminished due to interfering thoughts. Thought can only create problems, not solve them: UG says, “Thought is not the instrument for achieving anything other than the goals set before us by our culture or society or whatever you want to call it. The basic problem we have to face today is this: the cultural input, or what society has placed before us as the goal for all of us to reach and attain, is the enemy of this living organism. Thought can only create problems; it cannot help us to solve any.” Thought comes with a built-in program to create the next goal to be achieved – be it an educational degree, a house purchase, a promotion, a start-up, poverty alleviation or even enlightenment. Once one goal is met, another is generated automatically. Thought makes sure that happiness lies in the future, not in the present moment. How can such an instrument help us live a peaceful life ever? “Thought is your enemy”, like any other UG book, is not a light reading. It has no prescription. It is not meant to be understood. However, if you are open to reading between the lines, contemplate and perhaps ready to experiment with your own value system, then it may be a powerful companion.